First impressions are important, and the HP Envy 14 Spectre makes a great one. The glossy, glass-topped display bezel and keyboard tray look elegant and understated, and the uniform, thin chassis gives the laptop a sleek appearance. Second impressions are a little less positive, though: When you pick up the Spectre, it seems heftier than you’d expect. That’s because HP covered it in impact-resistant glass, similar to what you might see on a high-end smartphone. That pretty glass top is a fingerprint magnet, too. Encapsulating the monitor bezel in glass, however, allowed HP to build a 14-inch display into tight quarters--the Specre offers essentially the same width and length as most 13.3-inch Ultrabooks do. HP took advantage of the bigger display area, packing in a 1600-by-900-pixel native-resolution LED-backlit IPS panel. It looks great, and it offers superb video playback fidelity. Rather than matching the tapered shape of many competitors, the Spectre is just under 0.9 inch thin (barely meeting the Ultrabook specs that Intel set) throughout, which makes the system seem somehow larger than other laptops in its class. It also weighs more than many Ultrabooks (a spot-on 4 pounds without the power brick), partly due to the glass surface and partly because of the larger LCD panel. The LCD panel offers excellent horizontal viewing angles, and good vertical viewing from above the laptop. If you look from below the plane of the sweet spot, however, color and contrast shifting are severe. The screen is very evenly lit, probably owing to the LED backlight. Color saturation is good, and video looks quite nice, particularly high-definition video. The 1600-by-900-pixel display also makes editing photos a bit easier than systems with a more standard 1366-by-768-pixel display typically do. You can put that display to good use right away, since HP includes full versions of Photoshop Elements 10 and Premiere Elements 10. 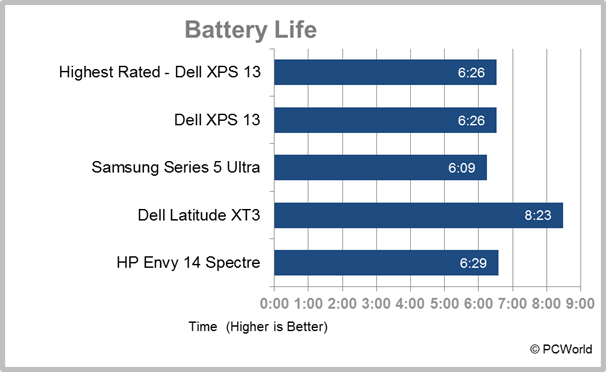 Performance, on the other hand, is a little disappointing, trailing behind that of similar systems in the class, such as the Dell XPS 13. 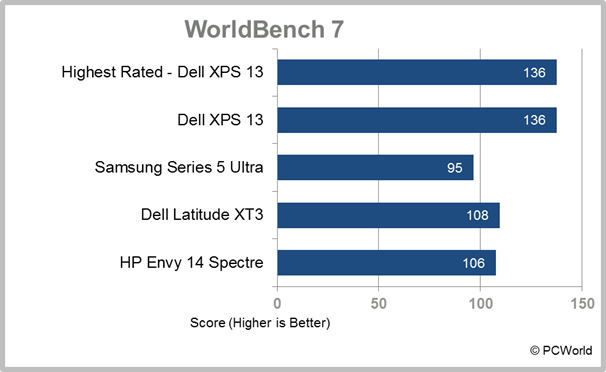 The Spectre posted a mark of 106 on WorldBench 7, the second-lowest in comparison with four similar Ultrabooks, but good overall performance nonetheless. 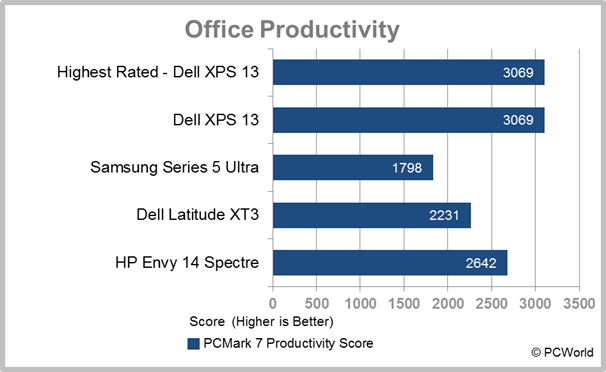 Plus, the Envy 14 generated slightly lower scores in our Web-performance tests. The higher-resolution display likely has some impact on performance, but having all those extra pixels makes up a little for the slightly lower scores. Battery life was about average for the class, at 6 hours, 29 minutes. Like most Ultrabooks, the Envy 14 Spectre is somewhat lacking in expansion ports, offering a scant two USB connections (one USB 3.0 and the other USB 2.0). All of the system's ports, including the two USB ports, the gigabit ethernet jack, the headphone jack, the SD Card slot, and the HDMI and mini-DisplayPort video outputs, are on the left side. I would like to see at least four USB connections on these units--the chipset supports that, and the Spectre certainly has enough chassis real estate for them. The base model of the Spectre includes a 128GB solid-state drive; HP offers a 256GB SSD as an option. You won't find a built-in optical drive, but that’s pretty typical for this class of system. Connectivity comes in the form of 802.11n Wi-Fi, Bluetooth 3.0, and wired ethernet. HP doesn’t offer an option for built-in LTE or any other wireless broadband technology. Audio is a mixed bag. At moderate volume, HP’s Beats Audio equalization system enables music and movie content that sounds richer than on most laptop speakers, but if you crank the volume past about 60 percent, you can hear noticeable speaker distortion. If you want louder audio, you’ll need to use headphones. The Spectre offers a convenient analog-style volume dial on the right side. 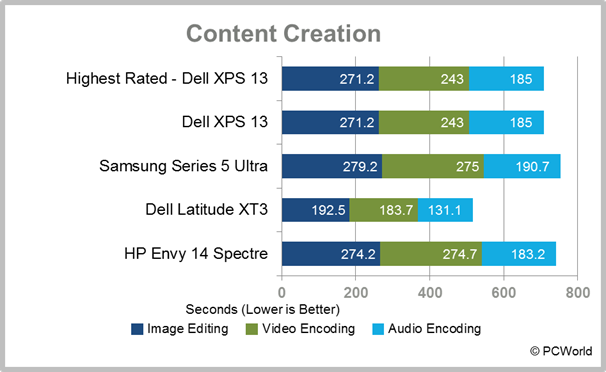 Like most Ultrabooks, the Envy 14 Spectre uses Intel’s HD 3000 graphics technology, so it’s suitable for only light-duty PC gaming at lower resolutions and detail levels. The keyboard offers an excellent feel, although the spacebar is slightly recessed, which results in mashed-together words when you miss pressing the spacebar all the way down. The touchpad is one of the best we’ve seen on a Windows laptop, coming close to the feel and usability of the larger trackpads built into Apple’s MacBook Air. Full support for multitouch gestures, proper button sensitivity, and tapping anywhere to make a right mouse click are welcome.